Sumo Wrestling remains an iconically Japanese sport, and one that the locals love and the tourists want to see. We really enjoyed watching it in Tokyo, and you can read about it here. Despite there being a slight decline in Sumo Wrestling’s popularity it remains an institution of this country. This is a guide on How to Watch Sumo Wrestling Tournaments in Japan and to help you to understand more about the sport, and the wrestlers. It will also give you practical advice on buying sumo wrestling tournament tickets, and how to get to the event. 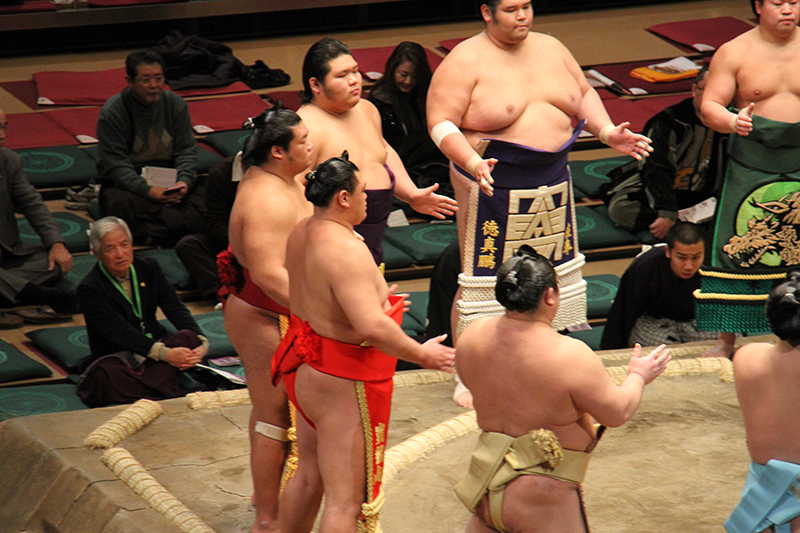 We will also explain the rules of Sumo Wrestling, albeit briefly, and what you can expect at this event. Sumo Wrestling is a sport that is based on the Shinto beliefs of the Japnese people. It is also a very real contact sport as you will see when you attend a sumo wrestling match. 0.1 What is Sumo wrestling? 1.3 When are professional sumo tournaments held? 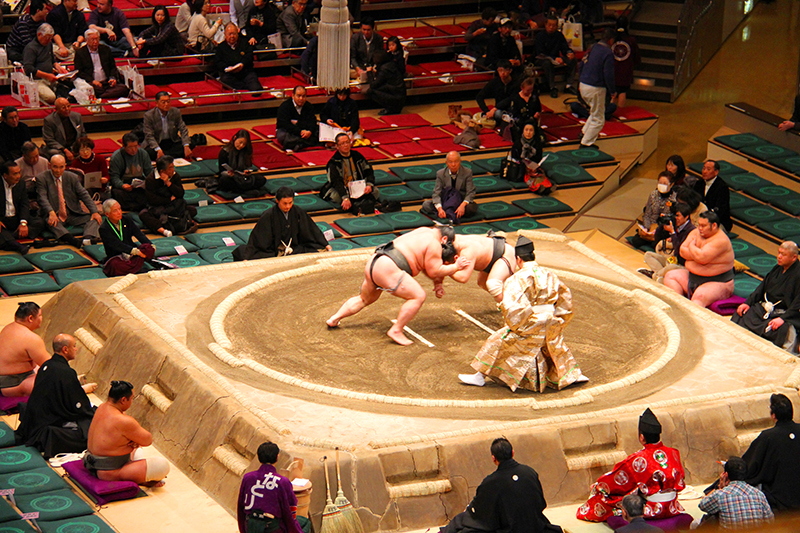 1.5 Which seat offers the best view of the Sumo wrestling matches? 1.6 What should you expect during the day of the match? Sumo wrestling is a type of full-contact sport that originated in Japan. It started in ancient times as an entertainment performance dedicated to the Shinto gods. 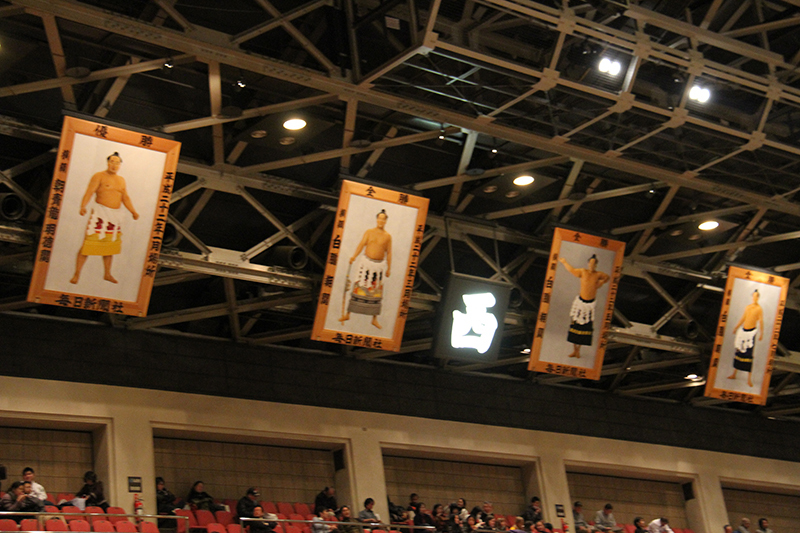 It is still based on religion but is also a professional sport, and not all of the Sumo wrestlers are Japanese. The first wrestler who exits the ring or touches the ground with any part of his body, besides the soles of his feet – loses. 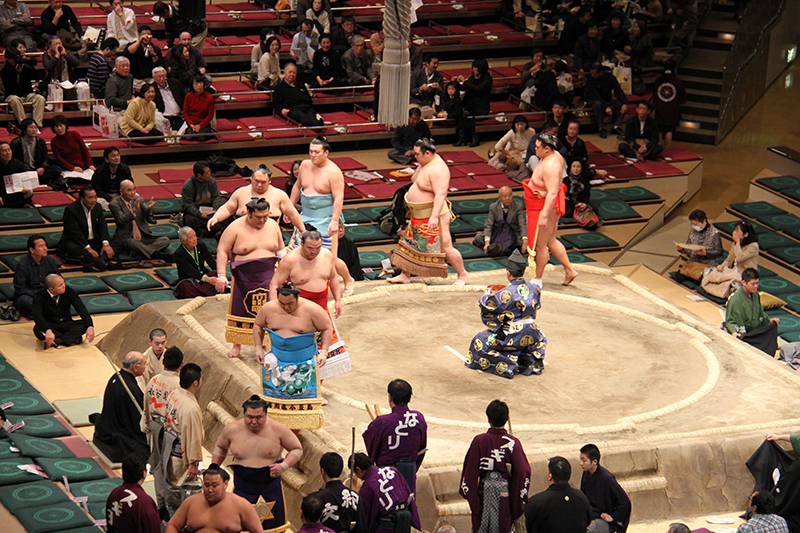 The matches take place on an elevated ring, called the dohyo, which is made of clay and covered with a layer of sand. There are no weight restrictions or classes in sumo, and that is why having a lot of weight is critical to a sumo wrestler, which we discuss in this article. Sumo wrestlers must live in stables that are training camps, where they train and gain as much weight as possible. They eat up to 20,000 calories a day. 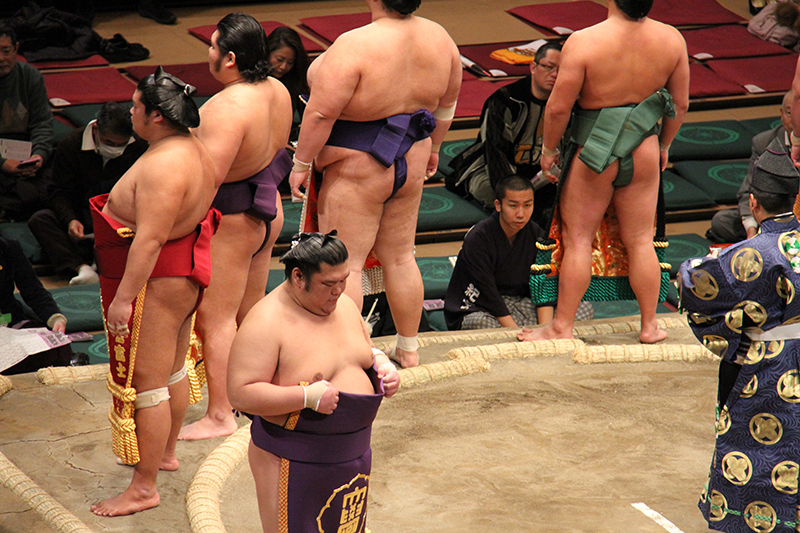 A normal person will have a BMI of 18 or thereabouts, but the Sumo wrestlers are generally around 45. Future sumo wrestlers a young age, if selected, they live in the stable, with the stable master, hairdressers, referees, etc. It is not an easy life. They train from 5.00 am, eat, drink, and sleep. At tournament time, they go through the prepping with their wardrobe and hair, which is all bound in ritual and traditional beliefs other than looking good. They initially dress in their ceremonial gear for the parade and then change into their fighting attire. It is all of these things that you find out that keeps you addicted to Sumo. Their diet consists of a stew called “chankonabe.” Chankonabe is essentially a stew served in a giant pot and is a staple of the sumo wrestler diet. Some wrestlers have superstitions about what kind of meat to use. Fish and cows are considered bad luck because unlike chickens; they do not stand on two feet like a good sumo wrestler should. That’s why at many sumo tournaments, chicken is the only choice of meat when it comes to chankonabe. They eat twice a day tend then sleep straight after so that the food can go to fat. They also drink at least 6 pints of beer with each meal, so it is probably no wonder that they sleep. When are professional sumo tournaments held? 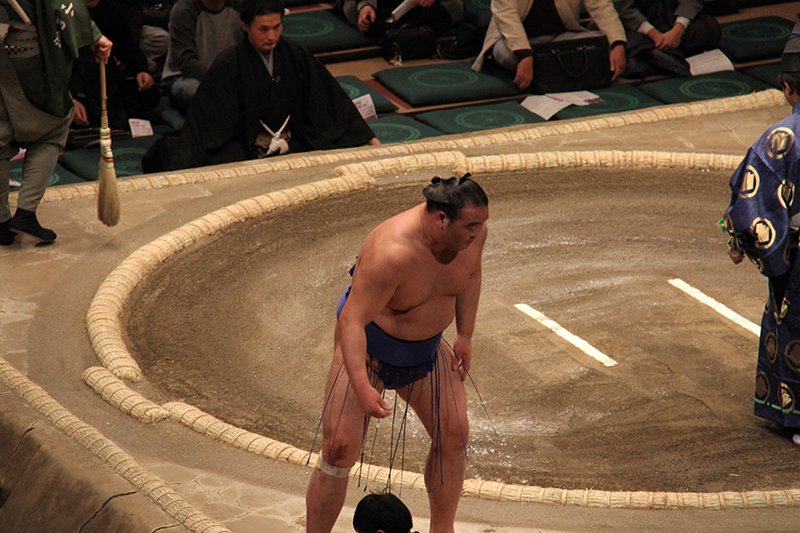 Japan holds professional sumo tournaments once per odd-numbered month, meaning there is a total of six in a year. In Tokyo, the events are scheduled in January, May, and September. In Osaka and Nagoya, the competitions are held in March and July respectively, and in Fukuoka, they are in November. Every tournament is 15 days long, and begins and concludes on a Sunday. Visit the official website of the Japan Sumo Association for date listings of upcoming tournaments. 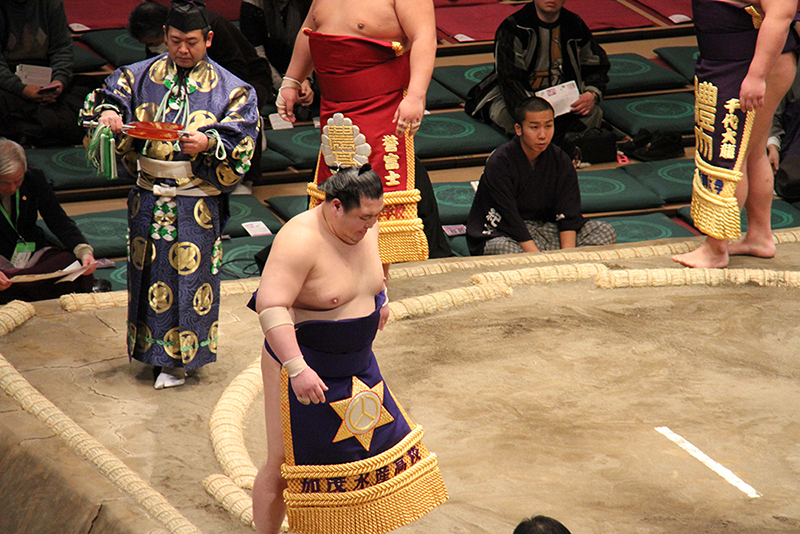 Purchasing sumo tournament tickets in advance is essential as tickets almost always sell out weeks before the actual event. If you are outside of Japan, you can buy tickets online through the official website and other authorized online sellers. We have used this agency and had no problems. 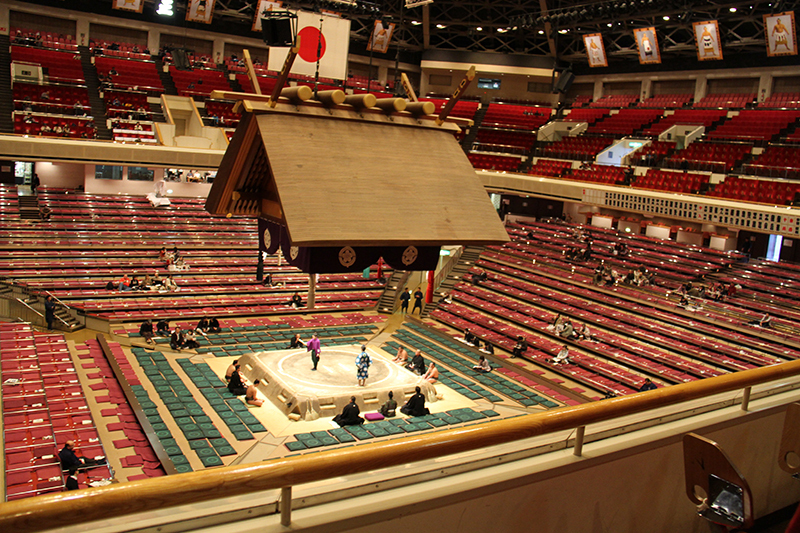 Which seat offers the best view of the Sumo wrestling matches? 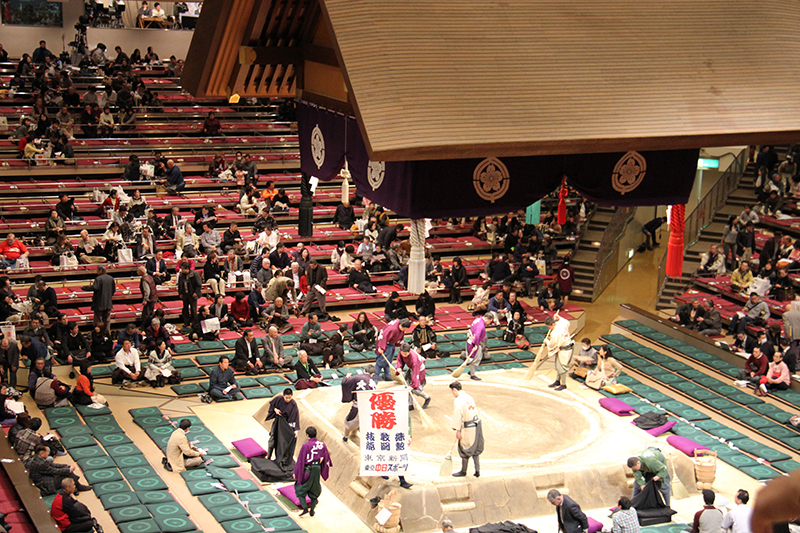 • Ringside – Spectators occupy cushions on the floor and are at risk of getting hurt as they have the closest vantage to the dohyo. These seats are the most expensive. • Box – Also located on the first floor, box seat ticket holders also sit on cushions and have to pay for all four seats in the box regardless of how many people are present. • Balcony – This section has Western-style seating and offers the cheapest tickets that can be bought at the venue on the day of the tournament. What should you expect during the day of the match? Matches of lower division wrestlers usually start at 8:30 in the morning, except on the final three days of the tournament, when they begin at 10. They are followed by second division matches at around 3 in the afternoon and top division matches at 4. The day typically ends at around 6 pm with a bow-twirling ceremony. Mounting the dohya, the wrestling ring – the wrestler executes a variety of rituals originating from Shinto religious beliefs. Encountering the audience, he slaps his hands to summon the gods, then carries out the leg-stomping shiko workout, to repel the evil spirits from the dohya, as the referee calls out the wrestlers name to the audience. There are 4 referees on each side of the square stage, and one in the middle. Then they start. They go to their corners have some water and wipe their mouths. Come back to the ring and throw salt in it – stare at each other and then back off, and do this a few times. Eventually … they start. The first one who touches the ground outside of the ring, looses. For information about getting from the airport to Tokyo, read this. To get to the Sumo Wrestling stadium at Ryogoku Kokugikan, take the train.The stadium in Tokyo is located next to the Edo-Tokyo Museum, and is about a five-minute walk from the metro station. There was so much great information here about the rituals and sumo wrestlers. That is a lot of calories to even wrap my head around. 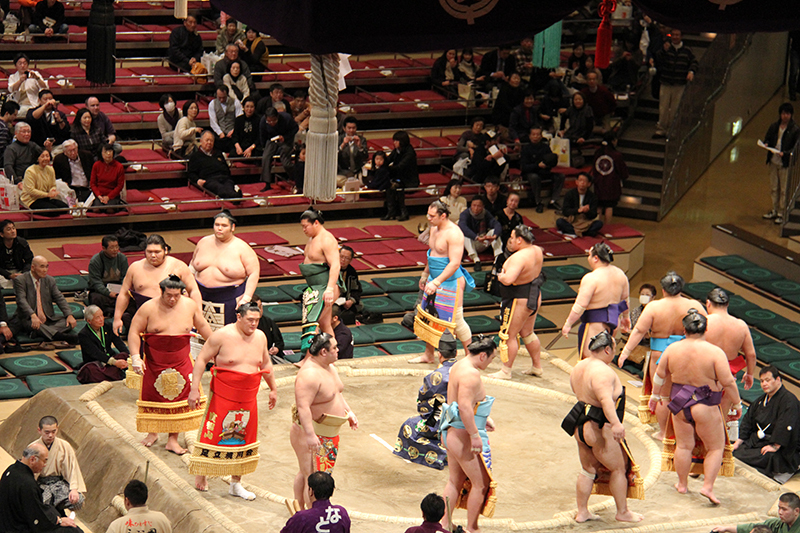 We have been to the Tokyo area several times and have never made it to a sumo tournament due to timing. We’d love to see this one day. I cannot believe all of the calories either. It is an amazing experience. If American has WWE, Japanese has Sumo. But Sumo includes religious belief which is very interesting. Thanks for sharing. I was concerned that Japanese Sumo might be staged, as it appears the WWE is, but it is not; and yes it is very bound up in Shinto beliefs. In saying that, there was a very real issue of match fixing a few years ago. Very interesting article, Paula. I don’t really like this sport, but I was always curious about it. It’s funny that in most sports you should be very slim in order to perform, while in Sumo wrestling you have to actually gain weight. It must be quite fascinating to watch these wrestlers from up close, but I don’t think I would enjoy sitting in the ringside. We got hooked on watching Sumo after we had finished skiing for the day and were watching it on the TV. It was then we decided to go and see it in real life, and it was amazing. They are very big boys that is for sure. Whilst I don’t really enjoy watching the actual Sumo wrestling I thnk if I was to visit Japan it would be a must to go to a tournament. The ceremony and rituals prior to the main event looks so interesting. It is so interesting to watch, and understanding what they are doing and why they are doing these things is imperative to getting the best experience from Sumo wrestling. This is a very interesting ritual. I didn’t realize how involved it was. Sumo wrestling is very much bound by many rituals. It is fascinating learning more and more about it.